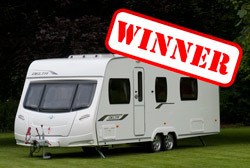 Tourer kitchens awards 2010 – The best kitchens on wheels! 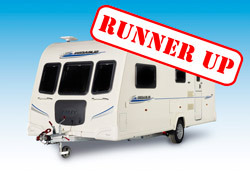 Liz and Dave King report on The Caravan Industry Awards which were presented in October and see if they agree with the judges’ findings. The Dometic-Cramer Kitchen Award, sponsored by Dometic-Cramer, is for the kitchen in touring caravans considered by the judges to be the most imaginative yet practical. Exhibitors may nominate one entry and there were eight entries in this class, only one of which was an import model. Models ranged in size from two to six berth model and in price from around £12,500 to around £22,000. The offside kitchen in the winning model, the Lunar Delta RS has a work top 155cm long and a dramatic looking, yet contemporary black enamel sink with a chinchilla glass lid. It’s an all singing all dancing kitchen with a 180 litre Thetford fridge/freezer, which has an LED display, an 800w 20 litre capacity digital microwave oven with defrost, re-heat and speedy cook programmes, a four burner hob with 3 gas burners and one 800w electric plate. The grill and oven are newly styled for this season. The three-speed, two-way Omnivent is well placed and there is one power point. Lighting is by two lights under the eye level cupboards, over the hob and sink. The freestanding table has a dedicated cupboard, near to where you’d use it, and there are a drawer, shelves, a pull-out basket, two eye-level lockers in the kitchen, but you might be glad of the space offered by the nearside sideboard. The offside kitchen in the runner-up, the Bailey Pegasus 514 has a work top a whopping 197cm long, and sports a new style rectangular sink 50cm x 31cm with its own chopping board and removable draining board. We did like the shaped cut out in the chopping board, “it’s practical” we thought. The new style gas hob with four gas burners has a flush fitting lid. The microwave is a 700w model with adjustable power settings, and the fridge is a Dometic 115 L with electronic ignition and a full width removable freezer compartment; this increases the fridge size to 122 L capacity. There are three eye level cupboards and plenty of space under the oven for pots and pans. The GRP wall board we decided would be easy to keep clean and dry with just a quick wipe over with an E-cloth. There is one power point, safely placed and a handy waste bin on the caravan door. LED lighting is standard. It’s a well equipped kitchen but recognise that Bailey has opted for equipment less dependent upon modern technology compared to the Lunar. *Caravan Insurance cost based on 2010 Lunar Delta RS valued at £20,895 which include VAT at 17.5%, fitted with hitchlock, wheelclamp. Also fitted with 2 AL-KO Secure wheel locks, Phantom Proactive Tracker and AL-KO ATC (all standard on this model). Kept on drive behind locked gates at HX2 7RZ. Caravanners over 30 years old, claim free for 3 years and a member of a caravanning club. Premium includes insurance premium tax at 5% and is correct as of 16.12.09. *Caravan Insurance cost based on 2010 Bailey Pegasus 514 valued at £16,140 including VAT at 17.5%, fitted with hitchlock and wheelclamp. Also fitted with AL-KO Secure, AL-TO ATC, Tracker Monitor and alarm (all fitted as standard). Kept on drive behind locked gates at HX2 7RZ. Caravanners over 30 years old, claim free for 3 years and a member of a caravanning club. Premium includes insurance premium tax at 5% and is correct as of 16.12.09.